Does it allow 45 degree panning? 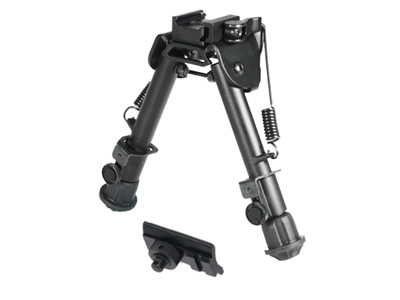 Will this bipod fit a synthetic benjamin marauder? Do you have the utg model bp-88 q leg length 77" 12.7" center length with 7 leg notches? Will this fit on the walther maximathors' stocks? Will this fit my Hatsan AT44-10 QE short? If it has the weaver rail option included ? You would need a dovetail to weaver mount made by airforce or utg , or install a swivel stud in the forearm of the pistol.